1m MPO / MTP Elite 12 fibre patch lead fitted with MTP female connectors, method A at each end. Multimode OM3 (50/125) Aqua colour . 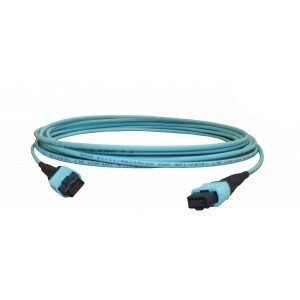 Key up to Key up, 3.0mm Cable Jacket, designed for 40GBASE-SR4 and high-density data centres. With a short UK manufacturing lead time of 2/3 working days. If you require pricing for an unlisted length please call us on 01702 443810. The 1m Patch Cable OM3 12 Fibre MTP® Elite - MTP® Elite is manufactured in UK advanced fibre termination facilities under stringently controlled laboratory conditions, and is quality controlled to rigorous standards using advanced fibre interferometry equipment.